A large stainless steel time capsule emblazoned with the logo of the U.S. Army Edgewood Chemical Biological Center (ECBC) shared the stage with federal, state, and local officials and leaders within the DoD’s Chemical and Biological Defense Program who spoke in celebration of ECBC’s 100th anniversary June 15. Speakers at the event also presented items to be placed in the time capsule for future generations. 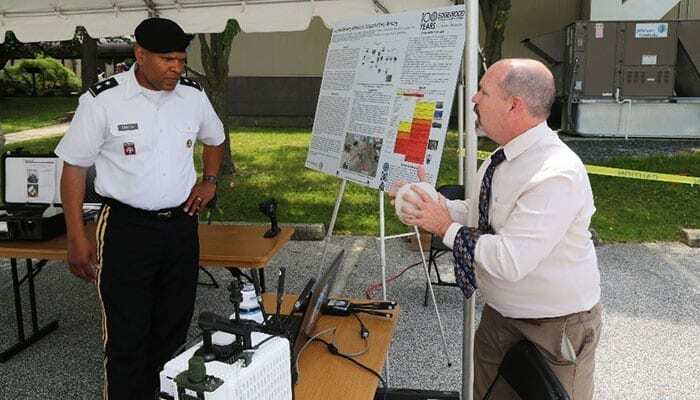 With a crowd of more than 500 invited guests and workforce members assembled beneath a pavilion at the Edgewood Area of Aberdeen Proving Ground, Md., ECBC Acting Director Eric Moore, Ph.D., noted that while ECBC’s mission lies in the research and development of technologies to defend U.S. warfighters from chemical and biological threats, it has been generations of ECBC scientists, engineers, technicians, and support personnel who have written the organization’s history. Another speaker, Jason Roos, Ph.D., deputy executive officer of the Joint Program Executive Office for Chemical Biological Defense, contributed an M50 protective mask for inclusion in the 12-cubic-foot time capsule, which will be opened 50 years hence. “This mask, and just about every other chemical biological defense technology we have fielded, was developed in collaboration with ECBC,” Roos said. Other speakers added commanders’ coins and proclamations to the time capsule collection. These items were in addition to a collection of technologies developed by ECBC scientists and engineers. These included the latest generation hand-held chemical agent detector used by Soldiers in the field, a second generation Tactical Biological Detector, the Joint Service Aircrew Mask, a newly developed decontamination solution known as DeconGel, a Chemical Reconnaissance and Explosive Screening Set, samples of forward-looking decontamination molecules called metal organic frameworks, and the ECBC flag flown aboard the ship on which an ECBC team destroyed 600 tons of Syrian declared chemical warfare material at sea in 2014. Also on display was a 10-foot high depiction of a statue of a Soldier in full chemical biological protective gear standing back-to-back with a scientist, which will be placed next to the ECBC headquarters building. Moore described the statue as symbolizing the profound partnership between the Soldier and the ECBC scientist in protecting the nation from chemical biological threats. At the conclusion of the ceremony, many of the attendees traveled to the ECBC Visitors Center to see a Field Deployable Hydrolysis System identical to the equipment used by ECBC operators to neutralize 600 tons of declared Syrian chemical warfare material aboard the MV Cape Ray, plus ECBC’s latest chemical biological surveillance system including an unmanned drone and an unmanned ground vehicle which work in concert with other sensors and a data integration system. Visitors also toured a mobile laboratory used to perform analysis of chemical and biological samples close to their point of collection. Other dignitaries who delivered remarks at the event included Col. Raymond Compton, chief of staff of the U.S. Army Research, Development and Engineering Command; Dale Ormond, principal director for research in the Office of the Assistant Secretary of Defense; and Brig. Gen. William King, commanding general of the 20th CBRNE Command. ECBC was created by presidential proclamation in 1917, establishing the Gunpowder Peninsula in Harford County as the Edgewood Arsenal. It quickly became nation’s principal research and development resource for non-medical chemical biological defense.